Happy New Year. Whatever your plans or challenges are for 2014 I hope it’s a happy, healthy year ahead. It’s time to pack away the Christmas decorations, pick the one needles out of the carpet (your clothes, socks, Cat and everywhere they will have permeated if you had a real tree in the house) and look forward to the new year. I never make resolutions, I believe if I want to change something or do something I should just get on and do it. Why wait for New Years day to promise yourself you’ll change or to start a new challenge? I do love the start of the year though, everything feels better, hopeful, exciting like a new day should feel, every day. In the sprit of the traditional New Years Day walk, and the start of my annual get fit plans, I went down to Port Meadow with all good intentions of a nice long walk, and getting some shots of the birds that flock to Port meadow when the winter floods come. Port Meadow is one of the County’s most popular haunts for birders. Annual winter floods bring spectacular flocks of wildfowl and waders. Lapwing and Golden Plover can number over a thousand whilst Teal, Widgeon and Canada Goose are often seen in their hundreds. Port Meadow is a magnet for migrating birds and almost every regularly occurring British species of wader and freshwater wildfowl has been recorded along with many Gulls, Terns, and song birds. I got as far as the car park! 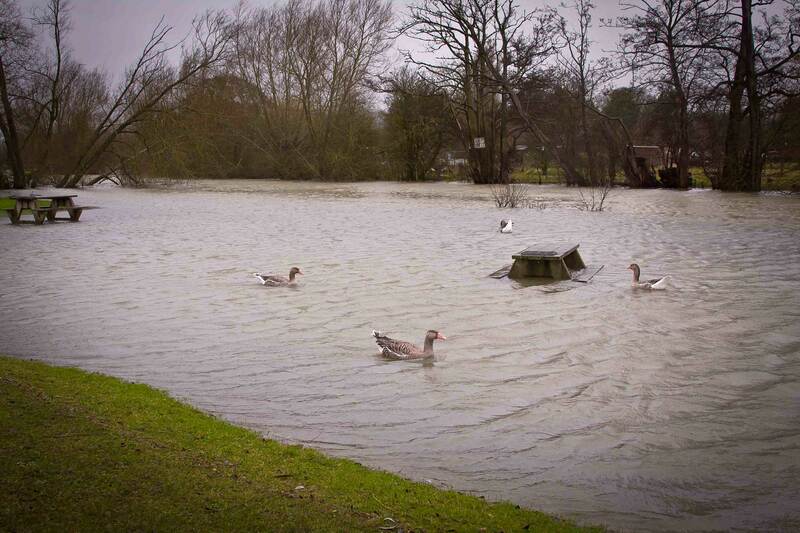 I might be wrong but but I think the floods may be a little more than even the hardiest of birds expected this year. The rising water certainly beat this New Year Walker and after being ankle deep in mud and fighting my way through howling winds to get to the edge of the meadow and take this shot I went home. No Picnic today!